The negotiations on the fiscal compact are going well and there are good chances for it to be agreed by the end of January and signed on 1 March, the leaders of Germany and France, Angela Merkel and Nicolas Sarkozy, said. They met in Berlin for the first time since the beginning of 2012 to coordinate their positions before the informal European Council at the end of the month. Which, as it became clear from the words of Mrs Merkel, was also an idea of France and Germany in order not to wait until March, when the first formal European Council was scheduled. The topics discussed at Monday's Franco-German meeting were the fiscal compact, the financial instruments EFSF and ESM, Greece, the financial transaction tax (FTT) and economic growth. As euinside wrote in details, the draft text of the fiscal compact has already undergone two revisions. It aims to ensure stricter budgetary discipline, especially in the euro area and closer convergence of economic policies. According to the latest revision, the goal is within five years the treaty to be incorporated into the EU legislation. Mrs Merkel paid particular attention to Greece, calling for the second rescue programme to be implemented quickly, including debt restructuring. In this respect, Greece is an exception, once again she underlined, adding that debt restructuring is a necessary precondition but not a sufficient one to get Greece back onto an acceptable path. Otherwise we cannot pay the next instalment for Greece, the German chancellor warned. Angela Merkel said that France and Germany wanted the temporary rescue fund EFSF to be more flexible and able to intervene on the primary bond market. To this purpose, the European leaders have asked the ECB to "to lend its expertise" to the Fund. On the eve of the European Council on 8 and 9 December 2011, ECB President Mario Draghi said that the institution was ready to act as an agent for the EFSF in its market operations. Then he explained that the ECB would prepare the technical capacities to intervene on bond markets for and on behalf of the EFSF, if the fund requested this, as the operation would not include the ECB's balance sheet because it would act only as an agent. In parallel, Paris and Berlin seek to speed up the payment of capital of the permanent rescue fund - the European Stability Mechanism (ESM), to enable the Fund to start operating by mid-2012. Initially it was planned the ESM to enter into force in mid-2013. But given the fears that the capacity of the temporary fund would not be sufficient for new rescue operations and the new activities, which the European leaders entrusted to the EFSF (such as buying government debt and bank recapitalisation), it has become needed to find ways the ESM to be launched a year earlier than planned. As regards the financial transaction tax (FTT), Sarkozy was provoked by a journalist's question why France and Germany wanted to proceed with its implementation as soon as possible and passionately explained that both countries believed in the principle of this tax, so they have been fighting for its introduction both at the EU and at the G20 level. Germany wants the finance ministers to deliver a final report on the topic by March 2012 at the latest. If we fail to convince the 27 Member States, we have to consider how we proceed, Angela Merkel said only a day after British Prime Minister David Cameron threatened to block the implementation of the FTT. There was an interesting debate on the subject in the economic committee of the European Parliament on Monday, which euinside will present to you in a separate text. The French president, in turn, said he would not decide on the matter before consulting with the social partners on 18 January. "We'll get the chance to talk more about this at the end of January when I will present to the French people the conclusions from the summit on the crisis," Sarkozy said. Thus, he directly linked the upcoming major European decisions with his campaign for the presidential elections in France. Sarkozy repeatedly stressed the Franco-German unity and the common will of both countries to work together to overcome the crisis. Obviously, in addition to discussing current European affairs, the meeting was intended to send a clear signal to the French voters, showing German support for Sarkozy. He especially thanked Mrs Merkel for the common work, "and for the great trust that exists between Germany and France." The meeting with the French president was only the beginning of a busy week for the German chancellor. 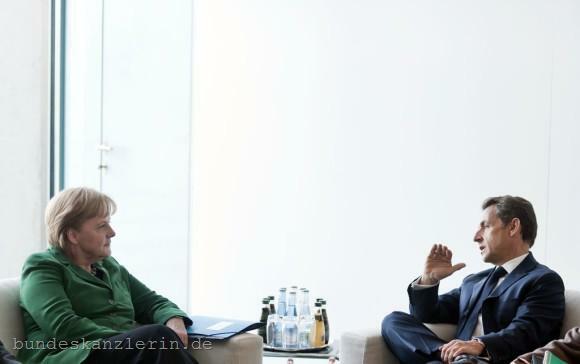 On Tuesday, 10 January, Angela Merkel will meet the IMF Managing Director, Christine Lagarde. In an informal atmosphere, the two world’s most influential women will exchange views on the current situation in the euro area and especially on Greece, without making any official statements, according to Merkel's spokesman. On Wednesday, she will meet Italian Prime Minister Mario Monti. He, in turn, will meet British Prime Minister David Cameron in the coming days, before meeting again Angela Merkel, but this time together with Nicolas Sarkozy, on 20 January.